I want to wish my sister's hubby, Del, a very happy birthday today. Del is a great guy and an all-around terrific brother. Once again he read the memo from the pharmaceutical company's management offices based in Indianapolis to the site laboratory where '589APPLE' was being developed. The note made reference to potential undesirable effects as addressed in test result number 04783, "This test stresses the need for further research before we market this drug for the public's use. However, this test result is to be excluded from results being submitted in the FDA package so as not to delay the approval for production. It is hoped that we will eliminate the concerns raised in number 04783 prior to the first sale." Adam looked through the folder for the mentioned test result and cursed when he realized it was still sitting in his bottom desk drawer. His cell phone rang shrilly and the librarian gave him a disapproving look. He picked up the contents of the folder and ran to stand outside the front door. Sondra, the girl in customer service who had replaced Davie was very agitated from answering customer's complaints about service. She was calling to let Adam know that a traffic accident nearby had taken down cable and phone lines and disrupted service to a large area. They needed him back at the office immediately. Late that afternoon he called Davie to tell her not to wait up for him that night. He ordered a couple of sandwiches in and looked at a long night ahead until his job would be done. Hours later, the crisis was averted and all Adam wanted to do was put his head down somewhere and go to sleep. He reached into his bottom drawer and found the test result he wanted to read earlier. But he was so tired that he could barely make any sense of the long list of statistics that headed the paper, so he folded it and stuck it in his shirt pocket. He was heading home to his bed and to Davie. When he came in, the TV set was on and Davie was curled up on the sofa sound asleep, she had obviously tried to wait for him after all. Adam turned off the TV and spent a moment watching her. This was the kind of memory he wanted to save forever. With all of the things in his life that had gone awry, Adam marveled at the good fortune he had stumbled upon the day Davie came into his life. "Hmmm… what time is it?" Her voice was sleepy. "How are you ever going to get up in the morning?" He was amused by the way her words slurred. "I'll go in late." He walked into their bedroom and placed her gently on the bed. Adam helped her while she fumbled into a night shirt and crawled under the blankets. Then he went to his side of the bed and stripped, leaving his clothing on the floor. He got under the covers and pulled her body up against his, he kissed her on the top of her head and whispered "G'night." Before he reached to turn out his night table lamp, he stopped to watch her sleeping in their bed… another memory for him to store. Character Development presented by multi-published author Chelle Cordero. Cordero will help you to develop fully dimensional characters and show you how to let your characters write their own stories. Bring your imagination and get ready for fun. Thursday evening, Feb 18 at 7PM. This workshop is art of the Rockland Author Series. The Rockland Author Series features a bookshelf of books by local authors and monthly writing workshops. Monthly workshops will be presented by local authors and will cover subjects such as character development, finding your muse, memoir writing, storytelling on paper and more and will provide great opportunities for all ages. Workshops are scheduled the third Thursday each month; check the Arts Alliance calendar for additional dates and event descriptions. The Arts Alliance of Haverstraw is a not-for-profit multicultural center for the arts. It was established by “a group of community members and artists with the commitment to celebrate the creativity of all of our people; our mandate is to give sustenance and to share the art of our rich and diverse cultural heritages.” The center is located at 91 Broadway in the Village of Haverstraw, New York in Rockland County. I've heard of various Indie shops and chain stores throughout the country that have also carried one or more of my titles on their shelves - if you know of any that currently have my books in stock, please comment below with the retailer name and location and you might win a prize! Walk up to the information desk at any Barnes & Noble Bookseller and you can order my books to pick up in the store. Then there are E-Books (& instant gratification!) from Smashwords, All Romance Ebooks, and OmniLit. Multi-published author Chelle Cordero will make an appearance at The Raider Bookshop on Saturday, February 13 from 2-4PM for a dual purpose – she’ll be promoting her latest novel, Common Bond, Tangled Hearts, and she’ll be there to celebrate the opening of The Raider Bookshop in Suffern. 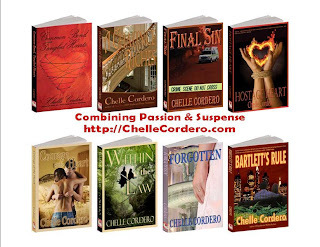 Chelle Cordero is the author of eight novels published by Vanilla Heart Publishing in Seattle, Washington; seven novels are romantic suspense and one is a murder-mystery. Bartlett’s Rule, Cordero’s first release, was named to Carolyn Howard Johnson’s Top Ten Reads of 2009 list, Final Sin is a 2009 Pushcart Prize nominee, and both Hostage Heart and A Chaunce of Riches were nominated in the 2009 P&E Readers’ Poll. Romantic-suspense novel Common Bond, Tangled Hearts was just released at the end of January and February 13 will mark its Rockland County introduction. All of Chelle’s books will be available for sale and signing. The Raider Bookshop, owned and managed by Adam Salviani, is part of international Raider Publishing and opened its doors in Suffern on January 5, 2010. The company, which is branching into retail according to Adam is looking to add a venue for Indie authors and publishers in an eclectic Rockland County community. Adam, also an author in his own right, grew up in Suffern and is pleased to bring his newest adventure home. The Raider Bookshop is located at 99 Lafayette Avenue in Suffern, New York and is located in the same building as the historic Lafayette Theater. They are open Wednesday through Friday from 11AM to 8PM and Saturdays and Sundays from 9AM to 9PM.